A new fully portable I.D. 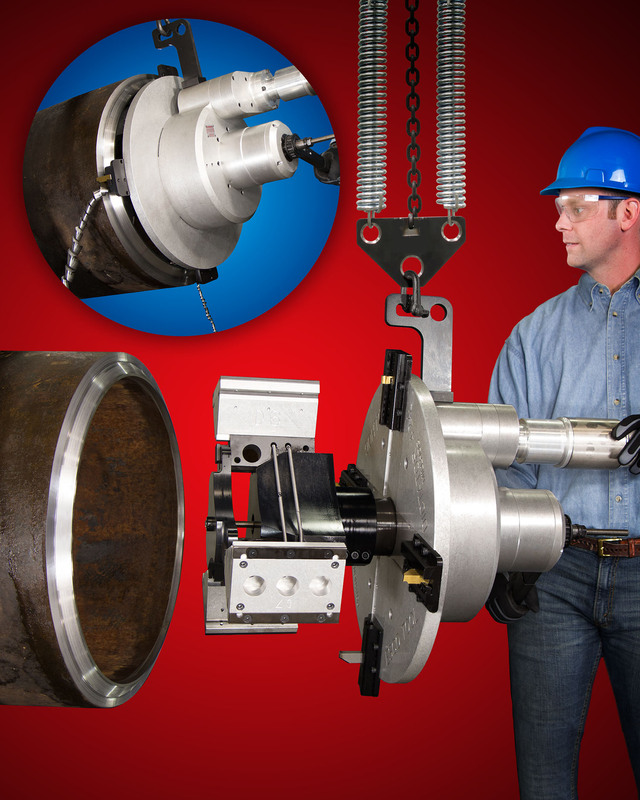 clamping pipe machining tool that precisely bevels schedule 160 pipe without requiring cutting fluids is being introduced by Esco Tool of Holliston, Massachusetts. The Dictator II MILLHOG® Pipe Beveller is ideal for the on-site beveling of pipe from 4.5” I.D. to 24” O.D. and utilizes one mandrel-wedge and eight sets of clamps for the entire range of the tool. Featuring three wide self-centering clamps for superior I.D. clamping, this chatter-free tool can simultaneously bevel, face, and bore highly alloyed pipe without fluids. Easy to maneuver and align, the Dictator II MILLHOG® Pipe Beveller includes a patented safety spring hanger, multiple position hoist, and a storage stand. Built to last, it uses dual-opposed tapered roller bearings and the EscoLock™ cutter blade holding system which secures the blades for rapid pipe beveling. Pneumatic, electric, or hydraulic motors are available. The Dictator II MILLHOG® Pipe Beveller is priced from $17,995.00 to $24,995.00. Price quotations and specifications are available on request.